Bead tapestry crochet and bead spinners were made for each other! Since tapestry crochet is done with a minimum of two threads, each thread may be strung with a single bead color. Only the color that is needed at the time is crocheted to form the motif while the other thread is carried. 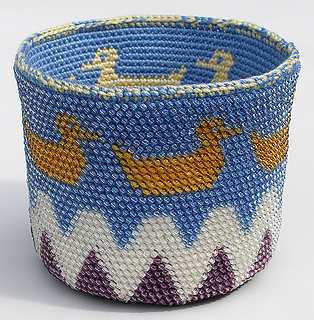 The bead falls to the back of the stitch and the colored threads contribute to the pattern and the substantial fabric that provides the basket’s structure. This flexible medium offers fantastic design potential since the design is not locked in – colors can be changed at any point!